The Altra Lone Peak 4 Mid RSM Trail Running Shoe is a part of the All-Weather Series, giving top-rated waterproofing so you can conquer more trails in any conditions. The waterproof eVent® upper is highly breathable, while still keeping water out and away from your shoes. 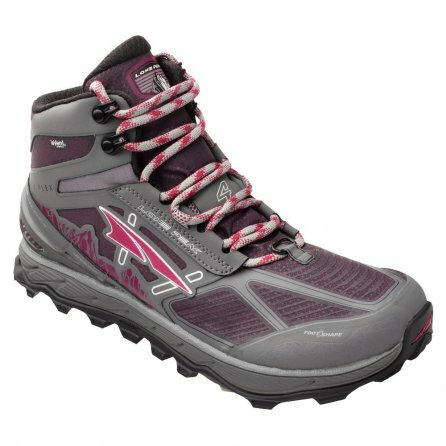 The mid-ankle design gives you added coverage with a hook-and-loop tab for easy gaiter attachment. Designed with Fit4Her™ technology, these shoes are designed anatomically for the female foot, and also have a dual layer EVA footbed for improved comfort. To keep you going on the trail, these shoes feature a DuraTreatd™ rubber outsole with TrailClaw™ technology, that improves your grip in just about any terrain. Whether you’re hiking or setting a new personal best on your favorite trail, the Altra Lone Peak 4 Mid RSM Trail Running Shoe will keep you comfortable and surefooted as you go.